When it comes to sports we all have our favorite teams. As fans, we are passionate, loyal and engaged with the teams we follow. If our team does well, we are happy. If they are struggling, we try and figure out what needs to be improved. Regardless of how they are doing, our teams create great branding and marketing opportunities for companies. Unlike any other advertising vehicle, integrated sports marketing programs deliver an engaged consumer in a positive environment that will pay attention to and respond to your message. So, the question is how do you associate your brand with sports to help grow your company. How do you go about creating a dialogue with a sports team or venue? What type of sponsorship program is best for your company? That’s where an experienced sports marketing agency comes in. They will build an integrated sports marketing program and connect your brand to this passionate, loyal and engaged audience. Having a well thought out integrated sports marketing strategy gives you the best chance for success. What is Integrated Sports Marketing? This hybrid marketing strategy straddles the old and the new platforms of marketing. The tried and true elements of sports marketing have been joined by the pervasiveness of social media and other technological avenues. So to ensure that your product or service is reaching your audience where they are most receptive, you need to have a well thought out integrated sports marketing deal locked and loaded. Integrated Sports Marketing – Why use an established sports marketing agency that’s is focused on sports? There are an amazing number of moving parts when it comes to crafting an integrated sports marketing deal. Knowing how to negotiate the right deal requires in depth knowledge not only of the sports team or venue but also fulfillment agreements, vendor verifications and activations just to name a few. Mills Marketing has been a big part of GEICO’s growth in the sports marketing arena. With Mills Marketing as a partner, GEICO grew from the 8th largest auto insurance company to number 2 in 18 years. 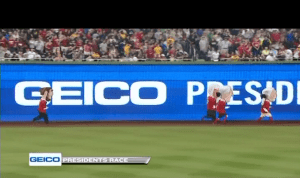 As an example integrated sports marketing, let’s look at the Washington Nationals Presidents Race / GEICO partnership. A high profile in-stadium interactive fan promotion. Tremendous client brand association with The Washington Nationals. Client name mention in PA announcements. Integrated, live regional sports network television coverage. During each home game, between the 3rd and 4th inning, the GEICO Presidents Race features 5 racing Presidents that compete in a race to the finish line. The race is a highly anticipated in-stadium fan favorite. As part of the negotiation with the Washington Nationals Regional Sports Network partner Mills negotiated the contract so that each race would be televised live over the television network. The sponsorship also receives frequent exposure on ESPN and the other national and regional sports networks. The race generates tons of social media views, comments and shares. The sponsorship also includes premium position center field signage that has the highest Repucom rating in the stadium along with rotational and LED signage. They also filmed a few GEICO commercials inside of the Washington National stadium to further the branding and the activations. This is just one example of the high-level contract negotiations that Mills Marketing brings to the table. An integrated sports marketing deal is obviously more than the sum of its parts but there are quite a few parts that need to be assessed and negotiated. Having a powerful sports marketing agency in your corner is critical to increasing your presence and your bottom line.